The Geographe Bay whale season has welcomed its largest visitors this week, with the appearance of the blue whales! Chris Burton (Western Whale Research) has been conducting land-based surveys from Pt Picquet since mid-August with the assistance of Ron Glencross and volunteers from Dunsborough Coast and Landcare (D-CALC). They have seen a gradual increase in humpback whale sightings over the last few weeks, as the south-bound migration from the Kimberleys begins to reach Geographe Bay. But on Sunday September 30th, Chris saw some exceptionally large blows during his shift down on the point. The two adult blue whales were seen moving west past Pt Picquet, surfacing several times before disappearing from sight as they rounded Cape Naturaliste. These large animals move deceptively fast, easily navigating across this section of the bay within 10-15mins. Definitely keeping our researchers on their toes! 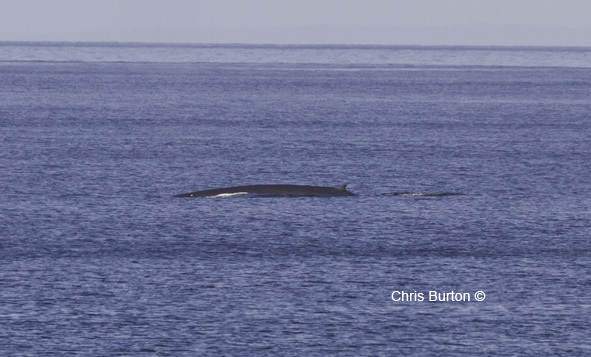 On Monday morning, just as they were packing up from the morning shift, Chris and D-CALC volunteer Julia Lang were lucky enough to spot another blue whale! “Just as we were putting the equipment away, Julia sighted a large blow north-east of Gannet Rock,” says Chris. “I got the binoculars back out of my camera case, and saw a large body rising up out of the water and yelled ‘Blue whale!’”. Chris quickly snapped off some photographs of the blue whale before it disappeared around the Cape. He will add these images to the Blue Whale Catalogue which has been maintained by Western Whale Research since 1994. Chris can then compare the unique individual markings of today’s blue whale to those of other previously sighted animals to determine whether this whale has been seen before. Such information helps build a picture of how Geographe Bay is used by both individuals and the population as a whole. Another three blue whales were observed during this week, indicating a possible early arrival of the population. Humpbacks abound, with many sub groups traversing the Bay. This year, observers have also described increased occurrence of southern right whales, with sightings being reported from Eagle Bay and Meelup Beach right up to Curtis Bay near Old Dunsborough. In particular, a sub-adult and mother-calf pair have been repeatedly observed using this area. Researchers will be holding a meeting in the next couple of weeks to compare photo-ID images of the various southern right whales sighted to determine their identification and residence period this season. In early November, a dedicated team of researchers from Curtin University will begin hilltop observations to continue the baleen whale theodolite-tracking program started in 2010.